Car 503, the Plaza Santa Fe, was built by Pullman 1950 for the Aitcheson, Topeka & Santa Fe's Super Chief. 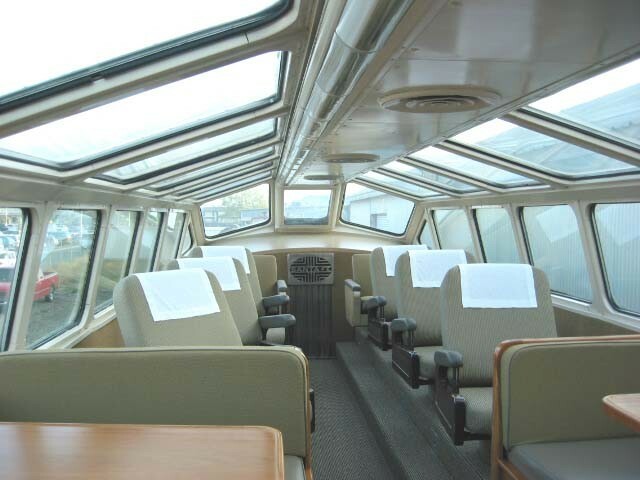 This was the only dome car on the Super Chief. Six were built (nos. 500-505) so the railroad could have daily departures in Los Angeles and Chicago. Six train sets were needed to maintain the 40-hour schedule. 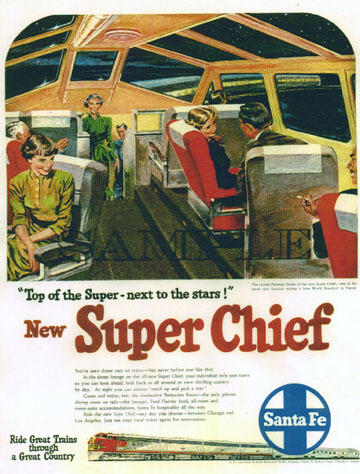 As you were traveling, you would pass two other Super Chief's going in the opposite direction. ATSF 503 was acquired by Amtrak in 1971 and renumbered to 9353. The current owners acquired the car in 1986. It has traveled untold millions of miles. 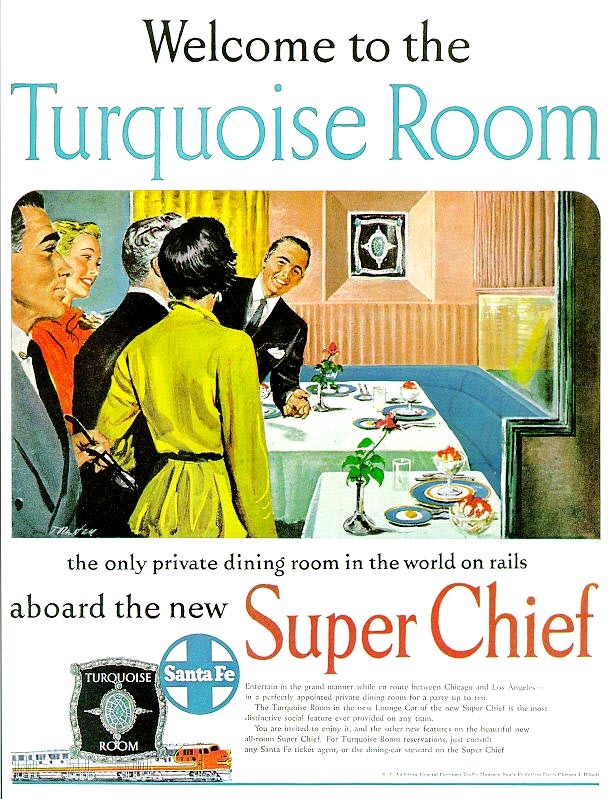 The Super Chief Pleasure Dome cars have no vestibule or side doors since they are bar/lounge cars. Passengers didn't need to entrain or detrain from them. The Turquoise Room is a private dining room that will accommodate nine people. 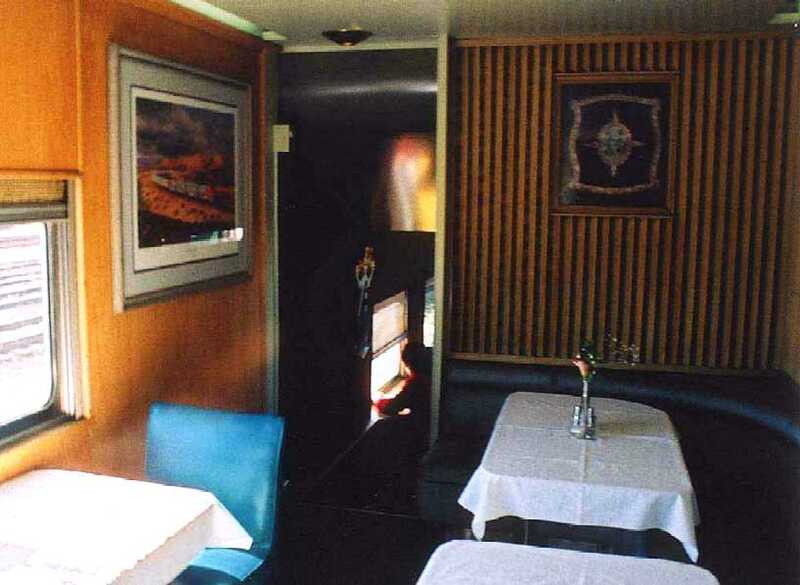 This end of the car always traveled next to the kitchen end of the dining car. 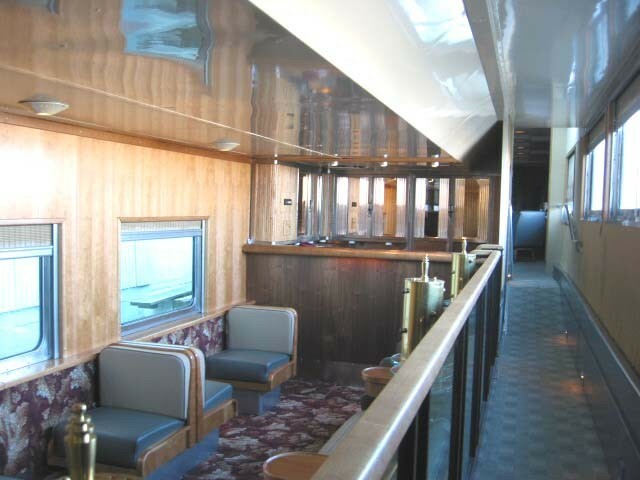 When aboard, note the small side hatch/door in the aisle way for stocking the bar. At the right is the full-load capacity of Pleasure Dome 503. These cars had the latest in technology -- buffs will note the "outside swing hanger" trucks. 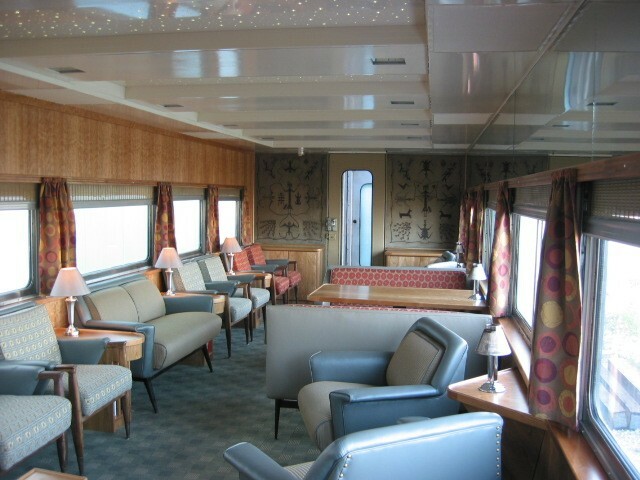 Here is the lounge looking toward the center of the car. See the stairway that leads to the dome. Here is looking back at the lounge from the dome stairway. Here is the bar below the dome. Here is the 18-seat dome. Vista-dome cars built by Budd had fixed seats in pairs. 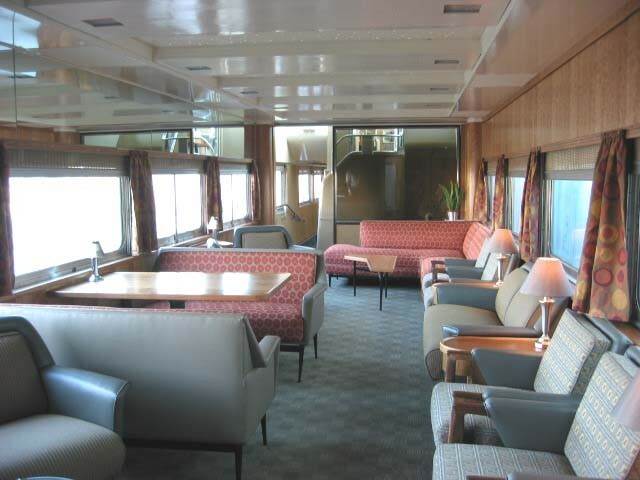 This Pullman-built car has several single-occupancy revolving parlor chairs. See the aluminum Santa Fe logo in the rear. Here's the Turquoise Room, a private dining room frequented by movie stars, etc. This end of the car ran next to the diner car's kitchen end. The staff had to carry the servings through the vestibules between the cars. Call me George.